The IPC took part in the 22 Science Festival organized in Warsaw (20-30th Sep.). The idea of the Festival is that events take place directly where the scientist work: in laboratories, experimental and seminar rooms. This formula allows demonstrations and experiments to be carried out, as well as visits in the laboratories. During the Festival we delivered three different lectures dedicated for secondary school students. 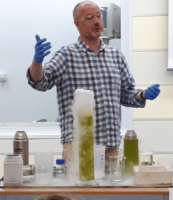 „Gases, liquids, solids” lesson with experiments and hands-on activities focused on states of matter and phase transitions, but also underlined the role of the experiment in natural sciences. “How physicist and chemist look at life - what for a biologist needs physicochemistry?” lesson combining history and latest achievements in the field of optical imaging. Both were based on the Open Day lectures organized regularly in the Institute. 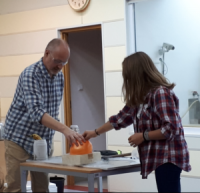 The lectures combine theoretical approach with experiments and hands-on activities and were attended by about 120 students from 4 different schools. Additionally, prof. Maciej Wojtkowski delivered a lecture entitled “New Technologies in the Imaging of Living Tissues and Cells”. This kind of lesson was a completely new type of activity, proposed this year for the first time by the organizers of the Science Festival. It was intended for students of the last year of high school, interested in research and science. The lecture discussed the latest problems of optical imaging and the achievement of this field, however in a form affordable to non-advanced listeners.